Upgrades made easy - whether you switch from one of our web hosting packages to a WebServer Dedicated or want to upgrade to a bigger package, your data will be moved automatically. You receive WebServer with your own fixed IP address. This enables you to integrate SSL certificates and manage your own e-mail or FTP server, for instance. Fully utilise all the resources of your server. Have maximum freedom and benefit from the full server performance. Add-ons and additional products for your product can be ordered easily via our customer information system (KIS). Install and manage a plethora of apps by point-and-click: Blogs, forums and many more web applications can be set up easily with the Easy Application Installer. In accordance with our Service Level Agreements we guarantee 99.9% availability of hardware and network. Price: € 99.95/mo. VAT 19% inc.
Price: € 59.99/mo. VAT 19% inc.
Price: € 299.95/mo. VAT 19% inc.
Price: € 329.00/mo. VAT exc. 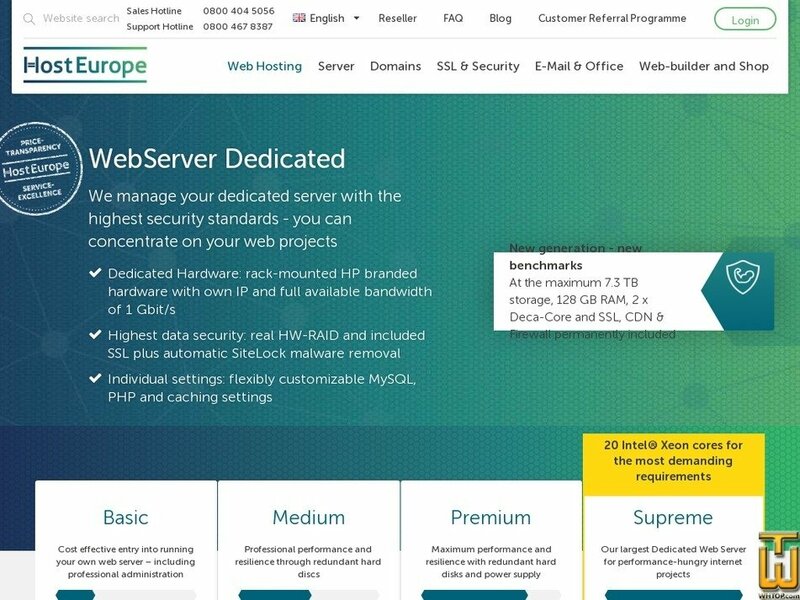 High End Managed Dedicated Server. Can be combined as a Cluster and Configuration can be changed according to customer wishes.